Standalone solution with some instabilities. The Amazon Fire TV / Amazon Fire Stick are HDMI dongles that are powered through a USB connection with a supplied power adapter. They include a remote. There is no app or other device needed to set up the Amazon Fire TV/Stick: just use the included remote and follow the on screen instructions to set it up for your WiFi. This process can be quite cumbersome as you have to enter each letter through the on-screen keyboard with the supplied remote. This article has more information on the set up procedure. 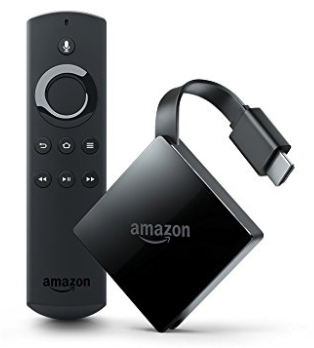 Amazon Fire TV/Stick is not a casting solution but rather has its own App Store, from which you can install either the Amazon Silk Browser or Mozilla Firefox. Once the browser is installed, you can open Walls.io directly in the browser by entering the Wall URL (again, through an on-screen-keyboard with the remote). Pros: independent solution with an included browser. Picture quality and speed were relatively satisfying in our testing. Cons: the screen turns black after about 10 minutes. This can be remedied with an app from the App store ("Keep Screen On Free" or "Wakey" are some apps we found that serve this purpose). We also observed random reboots during our testing.